Artist of the Spirit's Unique Life Coach Training & Certification Syllabus/Costs - Unique Coach Training - Intuition, Energy & Heart! Here is Artist's detailed syllabus to inspire you! And remember that throughout this training, you learn the skills and tools to receive ​three (3) certifications (CLC, CSC, CEC)! ​Week 1: Introduction; Why we Coach; What a Life Coach is and isn’t; General Life Coaching Guidelines; Ethics; What is Your True Work. 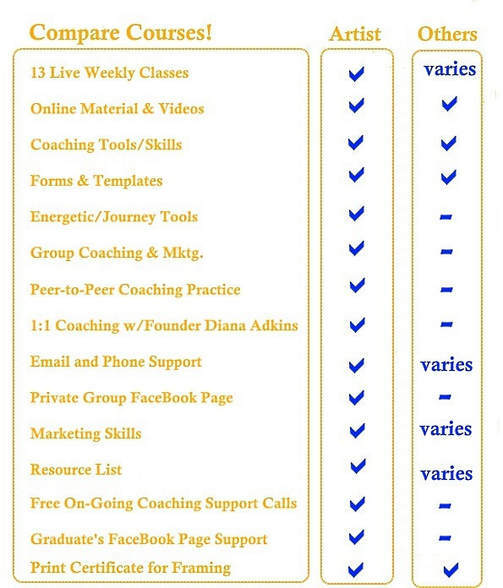 Discuss and understand the differences and advantages of being a life coach rather than a friend, therapist, colleague, mentor or teacher - what we do as coaches, and why; along with coaching ethics and guidelines. Week 2: Active Listening; Asking Pertinent Questions; Coaching Session Formats; Scheduling and Forms. Listening and asking the right questions are the cornerstone of life coaching and are skills to be learned. You also receive forms, coaching session guidelines, interesting client surveys, intake and session support forms and more that you can use 'as is', or custom tailor to your specific needs/niche/style. Week 3: Holding a Container; Holding an Energetic Container; The Gifts of Resistance; Conflict and Strife; Grounding & Shielding. We start working with and understanding energy here, and how to 'hold' for yourself and for others - no matter what is going on in or around you or them. We also discuss conflict, resistance and strife and how to hold a container when difficult issues arise in a coaching session. Week 4: Obstacles; Strategies; Strategy ‘Quiz’; Telling Yourself the Truth. This class explores a set of strategies we've identified that people use to survive/negotiate life and how to work with them, along with a 'quiz' or survey you can use with clients to help identify their specific strategy. We also discuss the importance of telling yourself the truth and how it relates to working with others. Week 5: Action Steps - Ideas, Examples and Experimentation. Action Steps are the way we create forward movement to achieve goals and are critical to success. Explore ways to attain life and personal goals and how to support others to move forward toward their dreams. Week 6: Action Steps – Mental-Emotional-Physical Purification, Unraveling Strategies, Emotional Release. Learn a variety of ways to approach the many issues a client can present with in body, mind and spirit. Week 7: Shamanic/Energetic Tools – Energy Basics, Grounding, Shielding, Stalking, Recapitulation, Meditation, Cord Cutting, SRI basics, Ceremony, Altars. We will spend four weeks on energetic tools that work beautifully in a coaching environment. Whether on the phone or in person - these practices are powerful and effective in deepening awareness, offering comfort and creating change. Week 8: Shamanic/Energetic Tools – Inner/Shamanic Journey, Sanctuary, Inner Child Work, Clearing Energy Fields. More awesome tools to go much deeper into the subconscious and unconscious than traditional 'talk' coaching only! Week 9: Shamanic/Energetic Tools – Shamanic 'Inner Fire' Healing with HeatherAsh Amara (when available). This practice provides profound insight for yourself and your clients, and is the most complex practice you will learn. We spend 2 class sessions working with this. Week 11: Special Needs Topics – Suicide, Sexual Abuse/Trauma, Post Traumatic Stress, Eating Disorders, Body Image & Aging Issues, Depression, Recovery, Death. Here you will learn ways to support clients through the challenging times, as well as learn when a client needs more extensive therapy or counseling than a life coach can provide. Week 12: Self Care; Self-Esteem; Overcoming Overwhelm; Time Management. You are the most important part of your coaching business! And here you learn that truth - as well as ways to care for yourself, manage your time, practical tips for organization and more. ﻿Week 13: Money; Marketing; Calling in Clients; Marketing Tools; Social Media; Closing. Here we walk you through the current trends in marketing yourself, along with handouts, procedures and tools for the course and bonus materials: identifying your niche, group coaching and advertising, working with free session, links to free photos and services, marketing, taxes and more.